Abell 2061 is a member of the Corona Borealis supercluster and is located ~30' (2.7 Mpc) southwest of Abell 2067, with a relative line of sight velocity difference of ~600 km/s and are likely gravitationally bound (Rines & Diaferio 2006). This velocity difference is significantly lower than the ~1600 km/s estimate of Oegerle & Hill (2001). 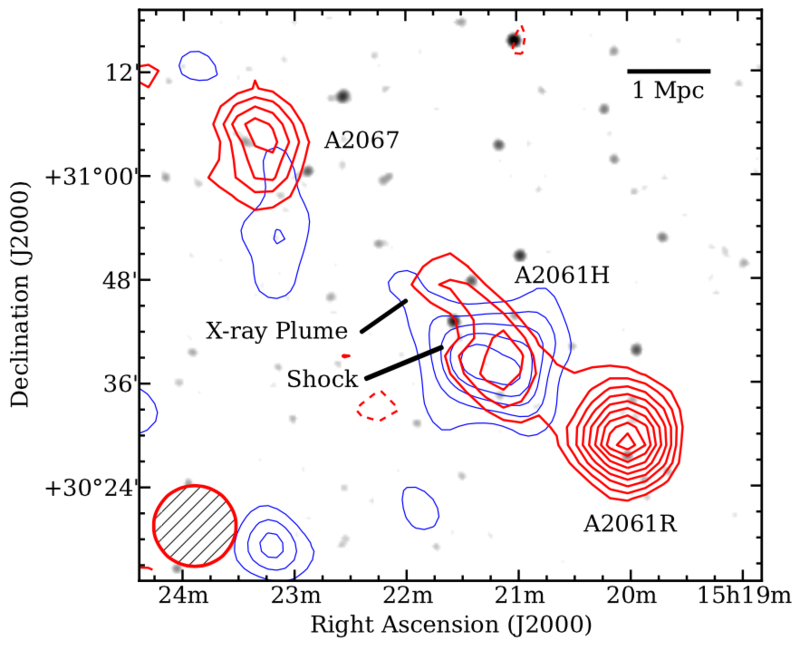 Rines & Diaferio (2006) note that A2061 is about 4 times more luminous in X-rays than A2067. Marini et al. 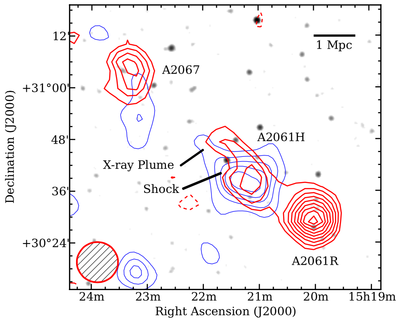 (2004) note that the X-ray profile of A2067 is elongated in the northeast-southwest direction towards A2067, however van Weeren et al. (2011) note that this elongation may be due to observed optical substructures within A2061 rather than an interaction with A2067. 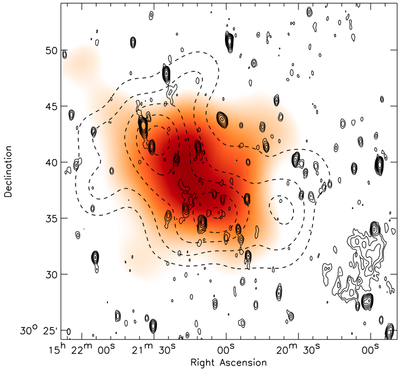 They also note that these substructure interactions within A2061 are likely the result of the observed radio relic to the southeast of A2061 (Kempner & Sarizan 2001; Rudnick & Limmerman 2009; van Weeren et al. 2011). Abdullah et al. 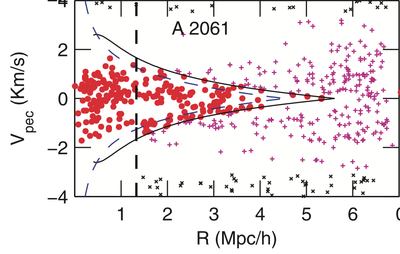 (2011) carried out an updated velocity dispersion analysis of A2061 find a velocity dispersion of 725 +/- 67 km/s corresponding to a viral mass of 5.45 +/- 0.19 x10^14 Msun. Einasto et al. (2012) carried out a Gaussian Mixture Model analysis of the A2061/A2067 system and found that it was best fit by a three component mixture. 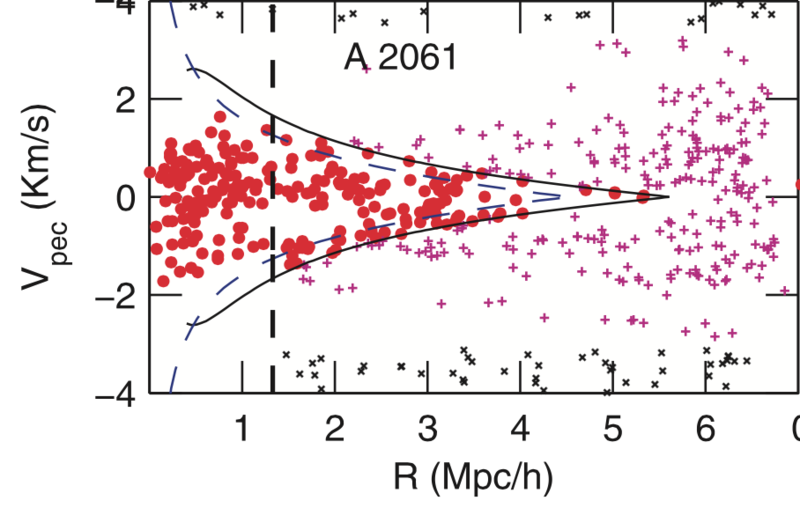 The Planck Collaboration (2013) included the A2061/A2067 system in their study of filaments between interacting clusters but don't note anything specific about this system. Farnsworth et al. (2013) used Green Bank Telescope observations and found evidence for a possible inter-cluster filament between A2061 and A2067. They also find the first evidence of a radio halo in A2061 at 1.4 GHz, and note that this qualifies it as a possible ultra-steep spectrum halo source. Based on Farnsworth et al. (2013) and van Weeren et al. (2011). Kempner, J.C. & Sarazin, C.L., 2001. Radio Halo and Relic Candidates from the Westerbork Northern Sky Survey. 548(2), pp.639–651. Oegerle, W.R. & Hill, J.M., 2001. 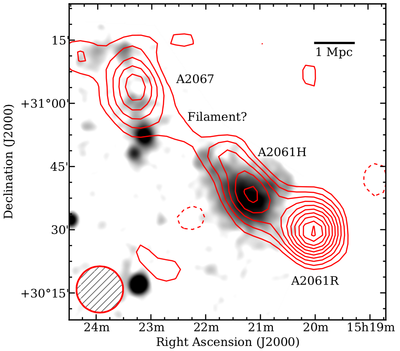 Dynamics of cD Clusters of Galaxies. IV. Conclusion of a Survey of 25 Abell Clusters. The Astronomical Journal, 122(6), pp.2858–2873. Marini, F. et al., 2004. BeppoSAX temperature maps of galaxy clusters in the Corona Borealis supercluster: A2061, A2067 and A2124. Monthly Notices of the Royal Astronomical Society, 353(4), pp.1219–1230. Rines, K. & Diaferio, A., 2006. 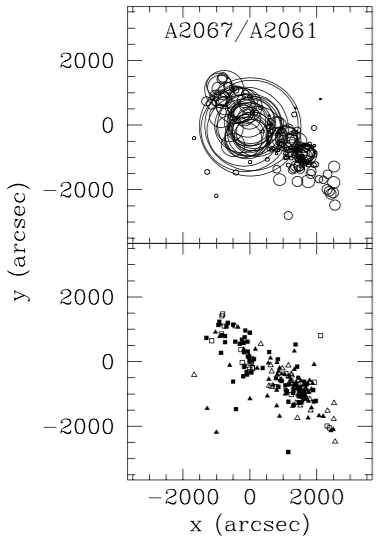 CIRS: Cluster Infall Regions in the Sloan Digital Sky Survey. I. Infall Patterns and Mass Profiles. The Astronomical Journal, 132(3), pp.1275–1297. Rudnick, L. & Lemmerman, J.A., 2009. 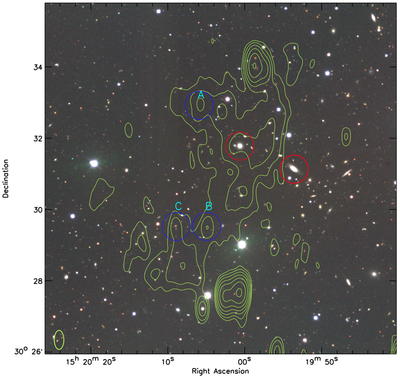 An Objective Survey of Mpc-scale Radio Emission in 0.03 < z < 0.3 Bright X-ray Clusters. Astrophysical Journal, 697(2), pp.1341–1357. Abdullah, M.H. et al., 2011. 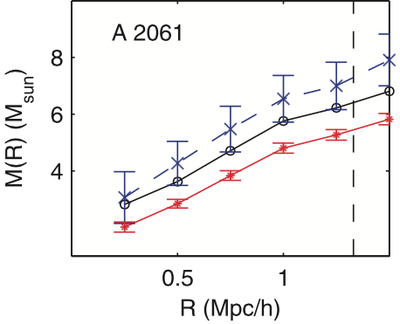 Studying the dynamical properties of 20 nearby galaxy clusters. Monthly Notices of the Royal Astronomical Society, 416(3), pp.2027–2040. Einasto, M. et al., 2012. 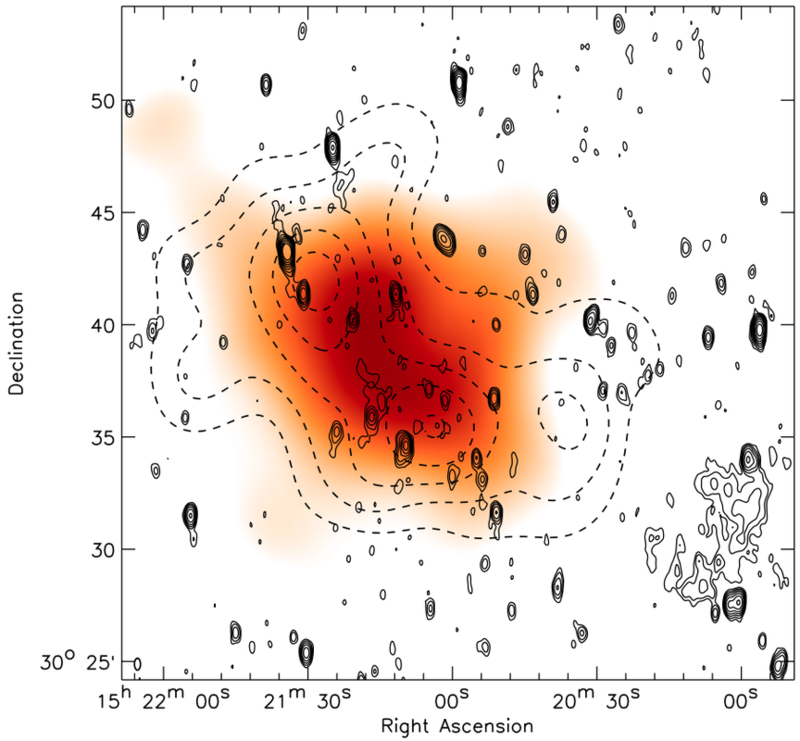 Multimodality of rich clusters from the SDSS DR8 within the supercluster-void network. Astronomy and Astrophysics, 542, p.36. Collaboration, P. et al., 2013. Planck intermediate results. VIII. 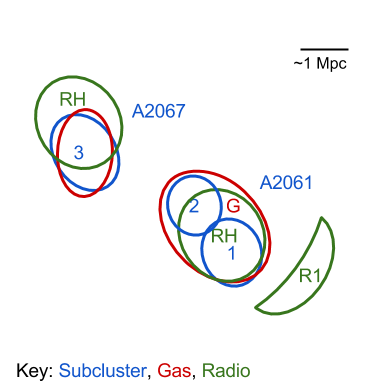 Filaments between interacting clusters. Astronomy and Astrophysics, 550, p.134. Farnsworth, D. et al., 2013. Discovery of Megaparsec-scale, Low Surface Brightness Nonthermal Emission in Merging Galaxy Clusters Using the Green Bank Telescope. 779(2), p.189.